This isnt actually HK selling out though; This is Gene Simmons confirming that he will sell out to anyone who writes enough zeros on their royalty cheque! “Kiss”, you are dead to me now!! 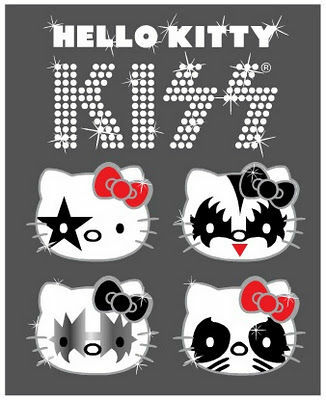 lol I love HK and KISS so I’d def buy these. And as far as Gene selling out… uh you would too.. money and money and we all want more so don’t blame him when anyone else would do the same. @Anne – I don’t have links, but GS has been a total (and I mean total) @$$hat about people using the Kiss images for charity events without buying a licence first that I feel entirely justified in my original comments. Next Hello Kitty band and makeup crossover: Insane Clown Posse. Shudder. i love how the second hello kitty kiss has a tongue even though hello kitty doesn’t have a mouth. I find it odd why Kiss. I wonder is because of an early series of Hello Kitty Plush, one reminded me of Paul Stanly and the other Ziggy Stardust. Now as fro Kiss, cut them some slack. Kiss is a business their job is to make money. Second were talking about a band that been around and had their zenith in the 70’s in my opinion and now well on their playing the nostalgia and oldies market. 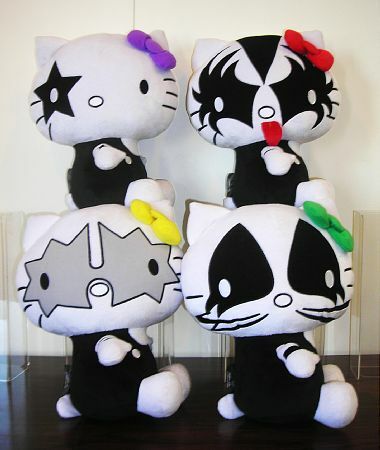 Now if it it was me I would used more than Hello Kitty; Batz Maru would be a better fit for Gene Simmons. @kitteh!! You are so right! The Peter Criss kitty is the most disturbing. It’s a cat made up to look like a man made up to look like a cat. I think my brain just melted. It amazes me how people accuse of KISS of selling out. They’ve been pretty much selling out since day one. I’m surprised they haven’t sold their body fluids and waste yet. Actually they have sold their bodily fluids. Each band member donated a vial of blood which was collectively mixed with the red ink used for the first issue of the Marvel/KISS comic book in 1977. The blood was extracted on February 21st, 1977 at Nassau Coliseum, NY during a concert tour stop and a notary public certified the authenticity of the process w/ the notarized document released as the ‘KISS comic book contract’.